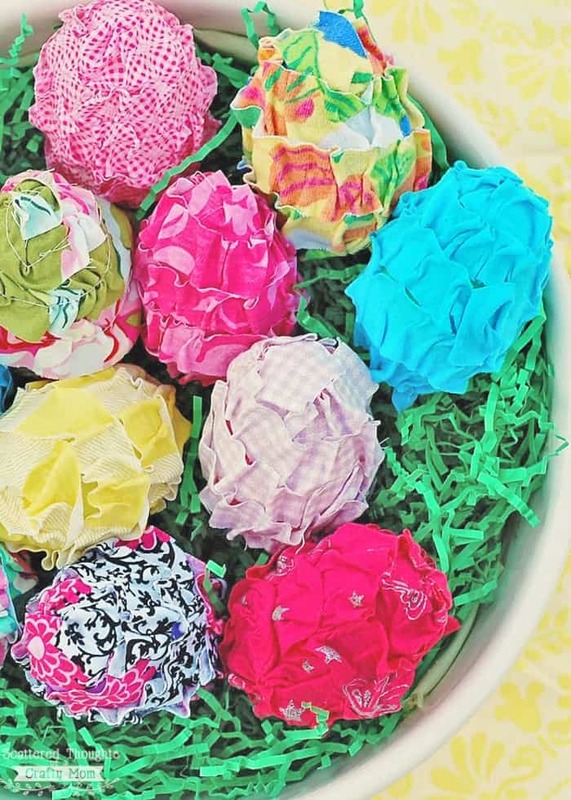 I have a fabulously easy Easter craft for you today! 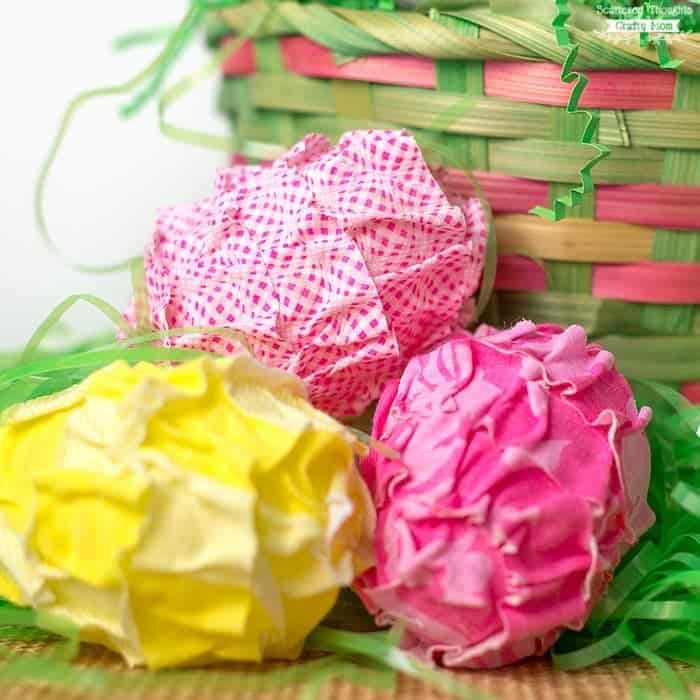 With just a few fabric scraps and some hot glue you can make these Ruffled Fabric Easter eggs. They are perfect for display and will add color and texture to your Easter decor. We are starting to do a little decorating around the house for Easter, as I was pulling everything out, I came across a bunch of plastic eggs from last year. I have seen these types of eggs decorated and displayed so many different ways. I thought it could be a great craft to use some of the fabric scraps I had been hanging on to. I experimented a bit on the best way to make ruffles and add them to the eggs. I tried ruffling the fabric on my sewing machine, but didn’t care for how much the gathering thread showed. (This was the olive green egg- you can see it in the photos below.) I finally decided to use a hot glue method for the ruffle. (It’s the same method I used on this no-sew tote bag.) Using the hot glue saved me a step and I think it looks prettier since you don’t see the gathering thread. Step 1: Add a dot of glue to the top of the egg. 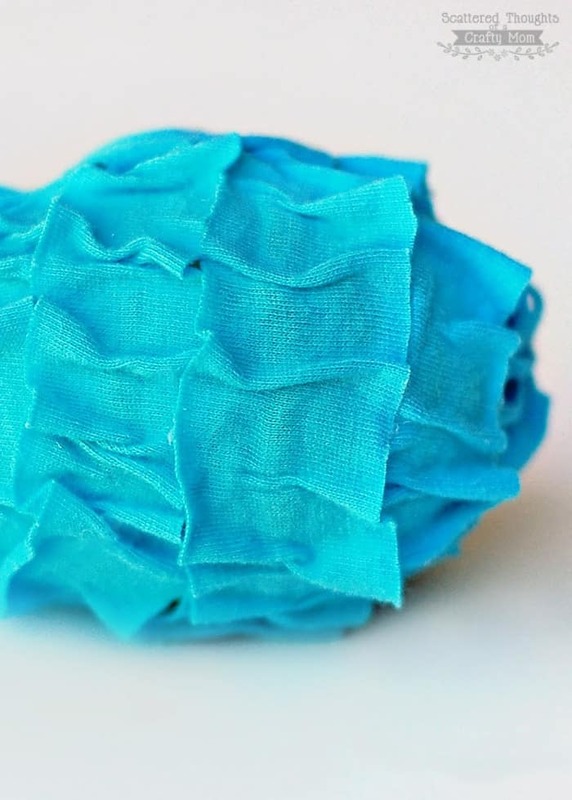 Step 2: Place the end of a ruffle strip in the glue and let it harden. 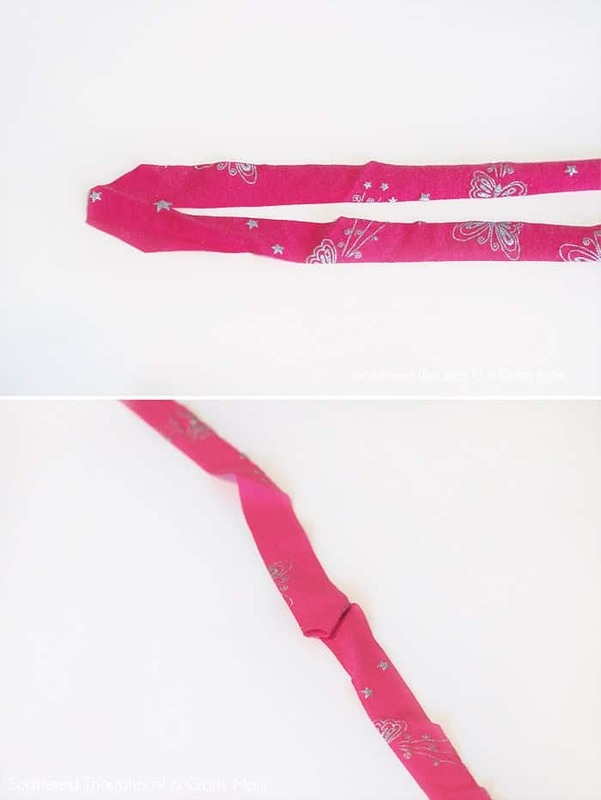 Step 4: Place the fabric strip in the glue and slide the strip down until it is ruffled. Keep doing this around the egg until the entire egg is ruffled. 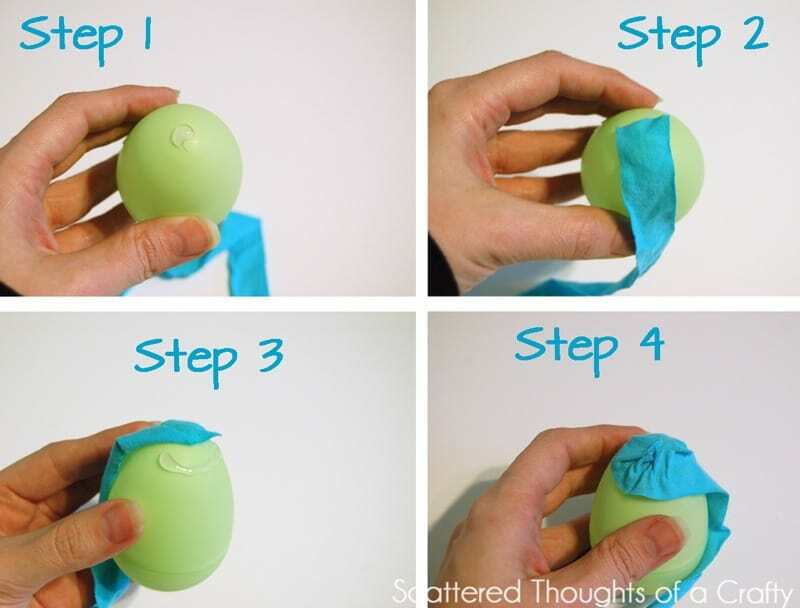 Step 5: Cut off any extra fabric, leaving just enough to add a dot of glue to the bottom of the egg and arrange the fabric so no egg is showing. They look so pretty, I thought a big bowl of bright Easter eggs would be the perfect Spring centerpiece for my kitchen table. Looking for more Ruffly Easter Goodness? 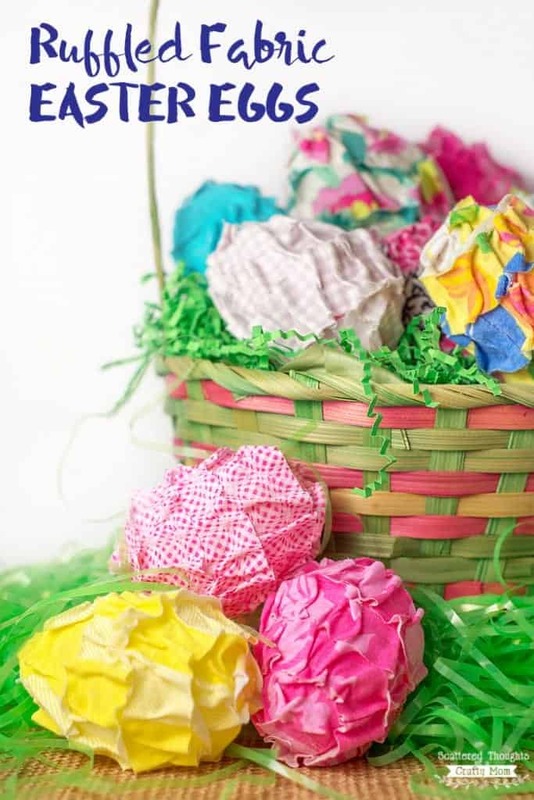 Be sure to check out my Ruffled Easter Baskets! « Have You Heard About the New Beyond the Scale Program from Weight Watchers? Such a cute idea! I love your ruffle eggs. Great cute idea, I love your ruffled eggs. Beyond simple and your fabric choices are outstanding – loving all the bright colors. So very clever and pretty. Thanks for sharing your creative inspiration at Sunday's Best. Very pretty looking eggs! So colourful and bright! How cute–I love all the colors you chose! Those are adorable! Such a cute idea. Cute. I really need to get my Easter decor out. These are so SWEET! I love the mixture of bright cheery Spring colors. what pretty colors! great idea! This is so creative! I love the ruffles that the fabric gives to the eggs. I'd love it if you shared this at Whimsy Wednesdays at http://www.thenymelrosefamily.blogspot.com/2012/03/whimsy-wednesdays-4.html. We go live Tuesday night at 8 EST. Thanks so much for sharing at Whimsy Wednesdays! I saw these are a finalist at Happy Hour Projects as an Easter craft and I'll be sure to vote for you. Thanks so much for sharing at Whimsy Wednesdays. These are fantastic! What a great way to use up your stash! Clever idea, love all the colors you picked! I also like the ruffled no sew bag you made. Found you via Inspire me Monday hop I am over at DearCreatives.com stop by if you like. I don't have a hot glue gun. I need to buy one. I love the eggs they are beautiful. 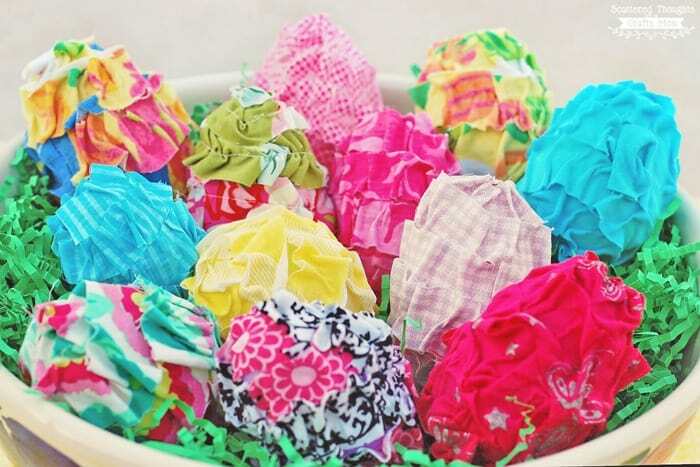 I love the bright colors and the ruffles…such a cute idea! How fun! There are so many fun ways to decorate eggs, aren't there? I just grew up decorating with PAAS. Thanks for sharing at Handmade Tuesdays. These turned out great. Such fun colors. I hope you'll add this to my Hippity Hop Easter Project Hop if you haven't yet. A lovely innovative way to decorate eggs, and would be quite easy for my girls to have a go at. Well done,and beautiful pictures too. Oh these are adorable! I love the fabric choices. Stopping by from DIY by Design. I love using my glue gun for ruffles, so thanks for this fantastic idea! Love it! These are so beautiful, I might just have to try this one! I would love for you to come share at my link party! I've seen a lot of decorated eggs lately but these are the first ruffled fabric ones I've seen. They're really cute! I found these on Fireflies and Jellybeans party. Oh for goodness sakes, you are too creative. I love these ruffled beauties, how fun!!! Soooo cute! Love how colorful they are! Oh are these little guys cute! I would love to have you share them at my party! How cute are these?! Love them! The ruffles are so cute! Thanks for sharing! These are my favorite by far! What a neat idea! These are adorable!! I love them. I love that you chose such bright happy fabrics too. I love the ruffled eggs!!! Pinning it! Oh my goodness! These are so cute! They'd go brilliantly with the Bunny & Duckling I made for easter! These are adorable! Thanks for linking up at whimsy wednesday! I want to feature these on an easter egg roundup I'm doing! Embracingmessy.blogspot.com. Please email me and let me know if this is ok at [email protected]! 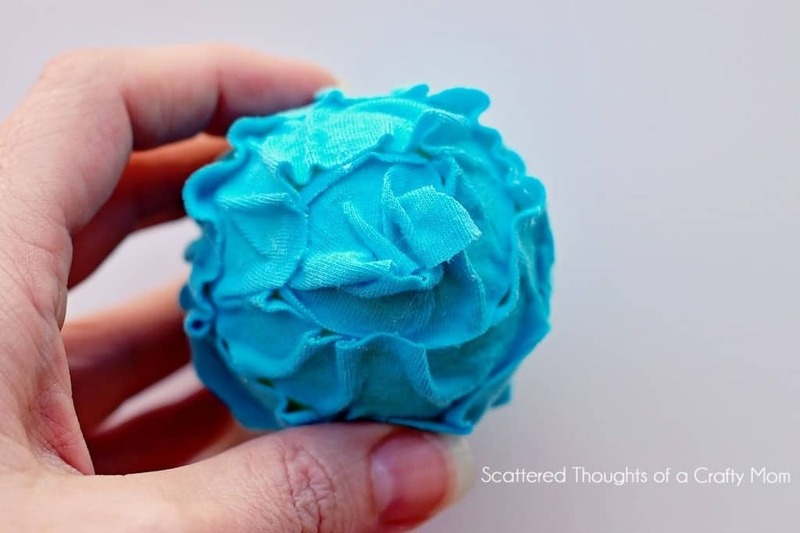 Thanks for sharing this fabulous tutorial at Inspire Me Monday at Create With Joy! I loved it so much that I selected it as one of my featured posts this week! These are so pretty!! What a great idea! Thanks for linking up this week – hope to see you back this week! Very pretty indeed! Something I never thought of and now wish I had! Great job. I am featuring your beautiful eggs today if would like to hop over and grab your featured button! Thank you so much for sharing. Loving this idea! Those are darling! Definitely something the kids could help! Pinned for making later! This is so adorable! I love this idea! Thank you for sharing!! Gonna try it in next Easter!